Charles-Erwan Savary, Champagne Ambassador to France and Wine Educator, is the founder and president of PEOPLE AND WINE, which organizes premier tastings for international companies and wine lovers, vineyard tours and consulting solutions to producers and importers. A former associate at Goldman Sachs in the real estate industry, Charles has also developed MONOPOLE WINE FRANCE, an investment-grade wine portfolio management firm offering rare and bespoke alternative investment solutions for individual and institutional investors. 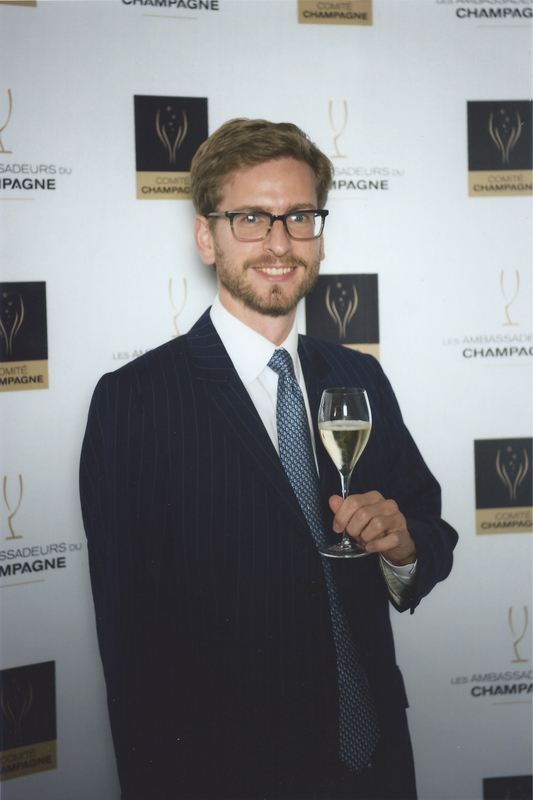 A graduate of the Paris Sorbonne University and the London School of Economics, Charles holds a Wine Educator certification from the Wine and Spirits Education Trust (WSET). In 2010, he was awarded the Special Prize of the European Champagne Ambassadors’ Award and became Champagne Ambassador to France. PEOPLE AND WINE is a luxury wine event and travel company offering unique and customized experiences holding exclusive relationships developed with luxury brands and premium wine producers with clients across Europe and in the US. AWP: Wine bestows a record of ownership from the beginning of its origin. We might say the wine drinker and connoisseur is also buying into the romance of that vineyards life. What is it about the wines of Champagne that make wine lovers connect in such a powerful way? For sure Champagne lovers do not praise only the liquid itself, but also the myth of Champagne. Drinking Champagne is attached to special moments with special people. Champagne is the most affordable and accessible luxury. It is rare to have Champagne as an everyday drink; this is definitely not a ‘table wine’. So you want to appreciate the moment and will keep Champagne for these very special moments, such as a celebration, a great party, a romantic dinner… But still you can afford it and find good ones in most retail stores worldwide. AWP: How do you explain the world’s love affair with Champagne: the culture, the people, the traditions, and the wine? CES: In 2014, according to CIVC (Comité Champagne), almost 308 millions of bottles of Champagne (+1% over one year) were sold with a very dynamic export market. This means that more and more people enjoy a sip of Champagne around the world! These are all great news, for consumers and producers! Everyone relates Champagne with happy moments of his/her life. Bubbles bring joy, disinhibit you and make you slightly euphoric. But it is also considered a prestigious wine. Offering Champagne for important times with family, friends, colleagues or clients has become a tradition and a must-do. AWP: What is the secret for Champagne’s inimitable style compared to sparkling French white wine? CES: Champagne leads the world of sparkling wines, French or foreign, for reasons which are both cultural (‘the myth of Champagne’ that makes it unique) and technical: in particular the art of blending (grape varieties, parcels and years of harvest) and the time on lees in the cellars. Blending is like alchemy: you blend wines with different typicalities of taste, acidity, aroma concentration, etc., and you have to imagine what it will give after the prise de mousse (when wine becomes sparkling through the second alcoholic fermentation in bottle) and a few years of ageing! You can only succeed after years of experience and that is why transmission between one cellar master to his/her successor is absolutely essential for any Champagne producer. Furthermore, there are not many vineyards in the world where producers can afford to keep their bottles 3, 5 or even 10 years in cellar before release (think about Bordeaux classed growths chateaux who sell their wine en primeur a year and a half before release!). This extra-time will add much complexity of aromas and a rare ability to age. To taste a bottle of Champagne that is 30 or 40 years old and is still refreshing (despite the loss of some pressure), the delicate acidity balancing the evolved aromas, is quite an experience. You may have been thinking only full-bodied red wines can age well: it is time to think again. AWP: Winemaking is very meticulous. How does the winemaker preserve all the characteristics of the fruit to achieve a good balance? CES: What is sure is that you need good berries in order to produce good wine. You can ruin your wine even with top quality grapes, but you cannot achieve a great wine with poor quality grapes, even if top wine producers are acclaimed also for their capacity to produce great wines even in low-quality vintages, thanks to a high command in winemaking—but don’t expect miracles if your crop is rotten. Then, fruity aromas are primary aromas that will be balanced with secondary (from fermentation) and tertiary (from ageing) aromas, and each grape variety will have different aromas of fruit, while some are more aromatic than others. You said a good word: balance; this is what you want to achieve, between acidity and alcohol (add tannins for red wines, but here we focus on Champagne). Fruity aromas will be worth if and only if the structure of the wine is in itself balanced, so that it can preserve these aromas well, year after year. Nice aromas with a flat acidity are useless. Moreover in Champagne, the concept of balance is going a step further: the art of blending (as we see in non-vintage cuvees which represent 80% of all Champagne produced) is meant to provide a balanced wine, that represents the whole Champagne and not one particular sub-area; a consistency over time and not the singularity of one vintage; a combination of the strengths of each grape variety without emphasizing one in particular. It is a rare play of precision to achieve such an overall balance. AWP: How would you describe its finesse and understatement? Is it capable of drinking well young or aged? CES: When well achieved, this precision naturally brings finesse of aromas and texture. Finesse means it is all in delicacy and complexity, without overwhelming foam. I like to compare Champagne production to watch making: it is the result of many small elements assembled in the right way that make it such a great wine. Here it is time to pay tribute to all these producers, both houses and winegrowers, who work hard to make a great product for our pleasure. Contrarily to wines of many regions, Champagne is released only when ready-to-drink. It means you don’t need to keep your bottle in the cellar before opening and enjoying it. Good news! However, extra-ageing can be interesting on some Champagnes, but here you have to distinguish the ageing on lees, only possible in the producer’s cellars, and ageing at yours with a bottle you bought in a shop or directly at the producer’s. The ageing on lees means the period of time in bottle, when you have poured your still wine (coming from the first alcoholic fermentation in steel vat or oak barrel) in the bottle, added sugar and yeasts for a second alcoholic fermentation to produce the sparkling effect, and then let the bottles laid down in the cellars for a few years. You usually release non-vintage cuvees after 15 to 24 months, vintage ones after 3 years, and prestige cuvees between 5 to 10 years. Releasing here means that you will disgorge the bottles to remove the lees (sediments) before selling to the market. Now if the producer keeps a few non-disgorged bottles for, say, 20 or 30 years, and if you are lucky to be invited to taste such one freshly-disgorged old Champagne, you will of course find slightly less pressure, evolved aromas of toffee, coffee, nutty biscuits, caramel, sometimes mushrooms, but you may also be amazed by the freshness of the wine. The lees help preserve the wine while giving it extra complexity. I am still salivating remembering some amazing tastings! Regarding the ageing of bottles you have bought; I would say: have a try. If you store your bottle in a cool place, without light or vibration, it will age well. Better of course if it is a prestige cuvee than a non-vintage cuvee. AWP: From 1940-1945, during World War II, many women tended winemaking and running the châteaux. How was it in the Champagne region of France? CES: The Champagne region, due to its geographical location, had a particular position vis-à-vis the Germans, during both World War I (when the Champagne region was devastated by massive bombing—see the half-destroyed Cathedral of Reims) and World War II (with requisitions of men for labor in Germany and of bottles of Champagne for the invaders!). During these hard times, women have played a key role of course, but I would say that women have played a key role in Champagne throughout history, not just during the war: think about Madame Clicquot, Madame Pommery, Madame Bollinger, Madame Jouët, just to name a few. AWP: What are the best Champagne post-war vintages to date? What made these truly great vintages? CES: Without going as far as post-war, regularly acclaimed vintages in the last 40 years include 1971, 1975, 1976, 1982, 1985, 1988, 1989, 1990, 1995, 1996, 1998, 2002 and, probably, 2008. AWP: Respond to the demands created by the Asian market, the U.S. market, and the British market. CES: Last figures available (International Wine & Spirit Research) show at wine consumption worldwide increased by 2.9% between 2009 and 2013, and should be +3.7% between 2014 and 2018. While the media focus was on Asia especially for Bordeaux wines, recent legal changes in China has dramatically changed the sales perspectives in that region; so the market will cool down a little bit and we should not find again soon such figures as the ones for the period 2009-2013 in China (+36%). Over the same period, the U.S. has boosted sales by +23%. The focus for the coming years will be more on the U.S. that will drive expansion in the global wine market until 2018, especially for premium wine. AWP: Is there one vintage that channels everything you love most about wine? CES: Tough job! Let me try: while connoisseurs usually acclaim 1996, I would personally favor more 1989 or 1990; especially for Champagnes that have not made malolactic fermentation where 1996 offers too much acidity to my taste. We were talking about balance before, but in such great vintages as 1989/1990, there is an unbelievable emotion. AWP: You are the Champagne Ambassador of France, and also for the regions of Bordeaux, Burgundy, Loire and its up-and-coming winemakers. Yours is a remarkable investment of your time and talents. Do you have a personal vision for France, its wines and oenotourism? CES: The world of wine and the wines of the world are in constant evolution. It is a global market with tough competition, new consumers, new trends, and new producing countries. Despite what we hear sometimes, I believe French producers are incredibly good at adapting to these ever-changing challenges. They mostly move quickly on to new markets, have made amazing progress in viticulture and winemaking over the last 20 years, and are aware of the necessity to keep changing. Of course it sometimes takes more time than expected, legislation can be constraining for both production and marketing, and many producers in all regions are struggling to survive, but I prefer to see the positive aspects. Oenotourism: most regions are catching up quickly; even 10 years ago, Bordeaux top chateaux were mostly closed and were sometimes seen as arrogant: nowadays more and more open their doors to visitors and have renovated their cellars and facilities as master pieces of architecture. Champagne and Burgundy are candidates to be included as a UNESCO World Heritage sites. There are so many other examples. The trend now is more and more to mix oenotourism with gastronomy discovery, sports and leisure, festivals, etc. Rare are the people flying 10,000 km just to visit cellars in the middle of France; but most of foreign visitors would enjoy a few days in the vineyards alongside their visit to Paris. There will also be more segmentation according to the type of tourists: VIP and HNWI tourists want exclusive wine experiences, and this is exactly what PEOPLE AND WINE provides them with. Acknowledgements: Alyssa Noel, student of French and Italian, and Journalism at the University of Minnesota-Twin Cities and English editor for A Woman’s Paris. Part Two: Wine in France: Charles-Erwan Savary on exceptional food pairings with Champagne and sparkling wine, published on A Woman’s Paris. You may also enjoy A Woman’s Paris® post Wine Lovers’ Choice: 154 Wines of France from Bordeaux and Champagne. Is “tasting stars” on your list for great food and wine pairings? Not sure what wines to try next? We, too, like wine lovers from around the world, have a special love affaiar from wine “where sudden friendship springs,” as John Gray said. We sip the wine and find dreams come through. Aren’t we always looking for clues that there is a “star” behind the recognized labels, for personal, unforgettable moments? Become a part of our conversation. We celebrate the art and ideas of people from every place and every heritage. Wine in France: Margareth Henriquez, CEO of Champagne Krug, shares with the world the vision of ultimate luxury that is Champagne. Margareth Henriquez, CEO of Champagne Krug: Real Luxury is always in front, is always the trend, so luxury can never be at the behest of what is increasingly demanding. It goes the opposite way—real luxury creates demand. Luxury will always be leading the way. It demands more than innovation and quality, yes. Luxury is the result of an emotional connection with the brand that comes from the way a brand behaves. Margareth is responsible for defining and maintaining the sophistication of the House of Krug. Wine in France: Carol Duval-Leroy, President of Champagne Duval-Leroy and respected partner of the global sommelier community, on the essence of exceptional quality Champagne. Carol Duval-Leroy joined the very select group of women involved in running Champagne houses in 1991. After the sudden loss of her husband that same year, she became the company chairwoman. For ten years, modernization of production processes, development of traditional distribution channels, increased product range and expanded exports have all been Carol Duval-Leroy’s objectives for her company. Today, the brand’s whole image bears the mark of her passion for this profession. Wine in France: Alice Paillard of Champagne Bruno Paillard on the delicate effervescence, remarkable purity, true freshness, and silky texture of Champagne style. It is probably the experiences abroad, combined with a fascination for the great wine that Champagne can be, that brought Alice Paillard back to where she grew up, in Reims. These contacts with very diverse cultures combined with the love for quality and the attraction of a young and dynamic company, quality gave her the will to join Champagne Bruno Paillard and help promoting her family’s wines through the world, in January 2007. Wine in France: Exceptional food pairings with Château Coutet Sauternes and dry white wines (recipes). The regions of Barsac and Sauternes have plenty of traditions, but there are no rules. There is no need to be a Michelin star chef—a grilled lobster or a roasted turkey will do the job. Also, pairing wines with cheese—Sauternes is the best hostess trick. When offering guests a diverse cheese tray, Coutet’s wines are the safest to serve; they go with most cheeses. Wine in France: Château Coutet’s distinctive quality celebreated in 1787 by Thomas Jefferson, and enjoyed today by wine enthusiasts worldwide. Former U.S. President Thomas Jefferson, then ambassador to France, celebrated Château Coutet as the best Sauternes from Barsac. In 1855, the estate was classified as a First Growth and recognized for its continued excellence. Today, as the oldest and largest Barsac estate, Château Coutet stays true to its tradition of distinction and quality. Wine in France: Aline Baly, third generation owner of Château Coutet, on refinement and distinction in wine from one generation to the next. Wine bestows a record of ownership from the beginning of its origin. We might say the wine drinker and connoisseur is also buying into the romance of that vineyards life. More than just fermented grape juice, it is the result of centuries of contact with a terroir, decades of families transmitting their savoir-faire from one generation to another and the daily rigor of a committed team to perpetuate the quality and style of a château into the future. Wine in France: Florence Cathiard of Château Smith Haut-Lafitte, together with her husband Daniel (both former French Olympic skiers), brings finesse and exceptional detail to making great wines.“Impose your good fortune, keep hold of your happiness and embrace risk: they will be watching you and will get use do it.” —René Char, French poet (1907-1988). It’s a motto Florence Cathiard tells her grandchildren hoping it will inspire them as it has inspired her. In 1990, Daniel and Florence Cathiard sold all their business interests to buy Château Smith Haut-Lafitte. Over a two year period, they invested massively in renovating both the winery buildings and the eighteenth century manor house, where they decided to live and to devote their energy to their new found passion: making outstanding white and red wines. Wine in France: Véronique Sanders of Château Haut-Bailly, and recipient of the “Chevalier de l’Ordre National du Mérite” honorary title awarded by the French government. The great wines of Bordeaux definitely symbolize tradition, quality and art de vivre à la française; they carry a strong image of the best of what France offers. Château Haut-Bailly is one of the greatest terriors of Bordeaux and Véronique Sanders, General Manager of Château Haut-Bailly, shares with us the defined sense of style and personality of its wines and her place among women in wine in France. Wine in France: Dewey Markham Jr., wine scholar, food connoisseur, and author of “1855: A History of the Bordeaux Classification” a James Beard award book, 1997. Dewey Markham Jr. gives us a taste for the process of establishing that connection between wine and the wine drinker and shares with us the truly great vintages of the twenty-first century from Bordeaux, France. Text copyright ©2015 Charles-Erwan Savary. All rights reserved. Leave a reply on "Wine in France: Charles-Erwan Savary, Champagne Ambassador to France, wine educator, and founder of “People and Wine” (part one)"